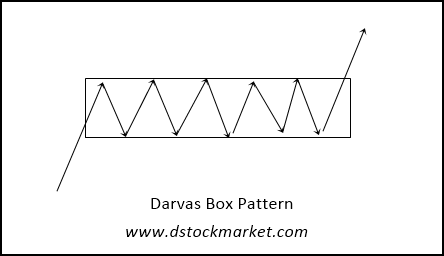 The bearish Darvas box pattern is a bearish continuation pattern that often appears in a very weak stock. The name Darvas is perhaps a popular name when it comes to trading the stock market. You might have come across his book "How I Made $2 Million In The Stock Market". In this book, Nicolas Darvas pointed out how he was able to find stocks that are going to go higher by searching for boxes. Today, we know those boxes are breakouts. You see, a stock often trade sideways or consolidates before it breaks out and moves higher. We can easily draw a box over the consolidation area and buy the stock the moment it breaks above the highs of the box. The image above shows how a Bullish Darvas Box Pattern looks like. The stock would already be moving up before the consolidation. The stock will trade sideways for a period of time. We call this a period of rest. The range will be tight and you can often draw a box easily over the highs and lows of the price action. Eventually the stock will break out above the range and resume the upwards move. Since the box method or consolidation works very well in finding a bullish stock, I wondered if we can reverse it to find a bearish stock. I have found that chart patterns often work whether they are bullish or bearish. If we can use boxes to find breakouts to the upside, we can reverse it and find breakouts to the downside. So, I have modified it a bit with some criteria to satisfy in finding a bearish stock. 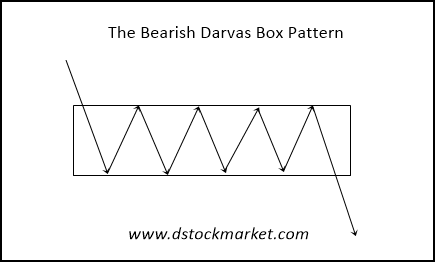 The image above shows what a Bearish Darvas Box Pattern looks like. First of all, the stock would have been declining. It will then consolidate for a period of time. Just like the bullish Darvas pattern, the bearish box will also be realitively tight. You can easily draw a box over the price action. Eventually the stock will break down below the box and resume the move lower. The reason why we want to see the stock below the 200 MA, 50 MA and 20 MA is because when a stock is below these moving averages, it shows us that the stock is weak. Having said that, never ever buy a stock that is below its 200 MA, 50 MA and 20 MA. It is a very bearish stock. On the other hand, you can take advantage of this knowledge and short the stock. To learn more about the 200 MA, 50 MA and 20 MA, read How To Use The Moving Average To Analyze Stocks. It would be best to see the stock below its "declining" moving averages. Declining moving averages sets in motion a bearish situation where the stock is most likely to move lower. With regards to the box, what we need is a relatively tight trading range. You need not have the same highs or lows but I would like to see either the highs are the same or the lows are the same. Once you have spotted the range, you can draw an imaginary box over the price pattern and wait for a breakdown below the box. The chart above is an example of how the Bearish Darvas Box looks like in real live. 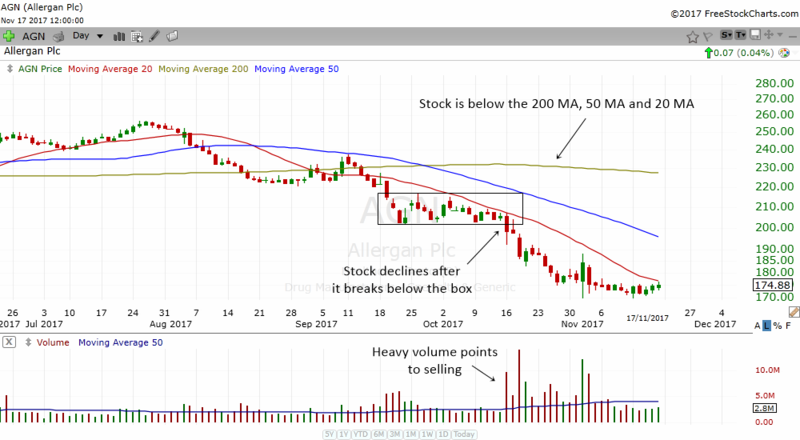 The daily chart of AGN shows the stock already in a downtrend. The stock is below its 200 MA, 50 MA and 20 MA. What is good about the moving average is you can see that the 50 MA and 20 MA is already declining. An obvious sign that the stock is weak. Notice how AGN had a period of consolidation? You can draw a nice box over the area. Notice also how the stock breakdown when it went below the box. If the breakdown is accompanied by heavier volume than normal, you can be certain that there are lots of people who are selling the stock. The odds that the stock will move lower increases with heavy volume. 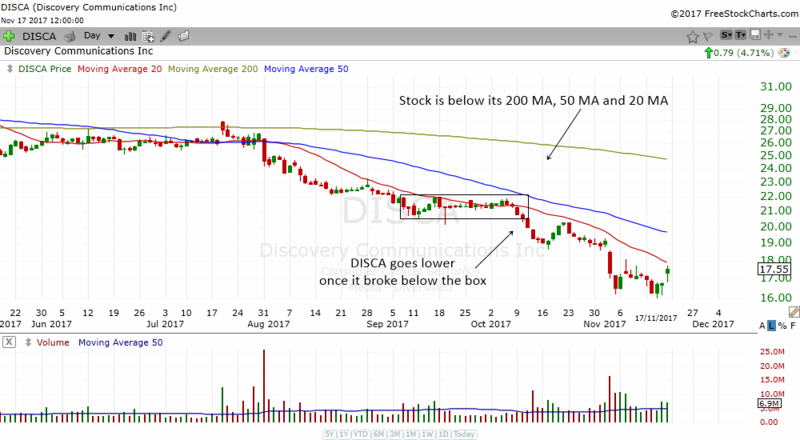 The chart above is the daily chart of DISCA. It also has all the characteristics of a nice Bearish Darvas Box Pattern. First of all, the stock is already in a downtrend. It is below its 200 MA, 50 MA and 20 MA. The stock had a nice consolidation and you can draw a box over it. Notice how the stock went lower when it broke below the box. The Bearish Darvas box chart pattern is an easy chart pattern to spot in a stock. When you see it forming in a stock, you should stand aside and not buy it. Alternatively you can also short the stock and make a profit from the decline. I find this pattern very useful and I hope that you will be able to use this pattern to your advantage as well.